Your chances of getting fit quickly and keeping your weight in check increase dramatically if you have exercise equipment at home. An elliptical machine is the perfect way to keep your upper and lower body toned and trim. If you're ready to make a dramatic change, purchasing a quality elliptical machine is one of the best places to start. Why? What's an elliptical? How does it help with weight loss? Which machines are best? Learn the answers to all of these questions and more in this informative article. An elliptical is a piece of exercise equipment similar to a treadmill, but vastly different in that it will save your joints a lot of pain (Read Elliptical vs. Treadmill). The machine has two platforms, one for each foot, and too handles for your hands. All of these pieces move independently. Most elliptical also offer some automatic workout options. 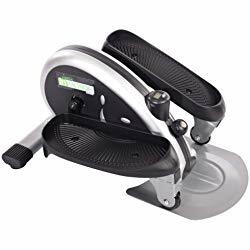 The design of an elliptical is such that it allows the user to move in a walking or running motion without ever lifting their feet from the machine. This means that there's minimal impact on the joints. In addition to giving you a cardio workout, the elliptical adds challenge to your core by forcing you to constantly balance yourself on the machine. In addition, you use your upper body by pushing and pulling the handles back and forth. If you don't want to waste time heading to the gym everyday, you'll have to purchase your own elliptical machine for regular use. This will help you achieve your exercise and fitness goals. But, with all of the options out there, which one should you purchase? Looking for an elliptical that will help you take maximum advantage of your workouts? HIIT style workouts are one of the most effective forms of exercise, since you can exercise for less time but still enjoy the maximum benefits of exercising. ProForm's Elliptical Trainer helps you get there with its quality equipment and workout plans. 32 workout apps to use, giving you a variety of workout options. A big resistance range is available with 24 different levels. Heart rate monitor on the handles. Fan included to keep you comfortable by working out. A warranty is included: 3-year for parts and 1-year for labor. Emphasis on stepping/climbing stairs motion that gives you a great workout. Compact footprint, making it piece of workout equipment that will fit easily in your home. #11 Bestseller on Amazon for elliptical trainers. This is a great rating! Reasonable cost: $899 at the time of this writing. The step size is not adjustable, meaning you can't change it to meet your step length comfort needs. Customers report having trouble with the customer service. Mixed bag of reviews from customers. Some customers expressed frustration that a workout app is promoted on the machine, making it seem like you can only use the machine with the app. However, there is a way to use the machine without signing up for any apps or signing up for a subscription. 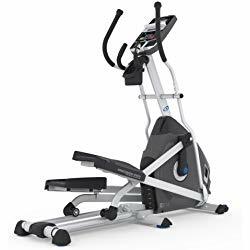 This full-sized elliptical offers you adjustability for maximum comfort, even if people of different heights will be using the machine. In addition, you can make use of pre-programmed workouts that will run automatically, allowing you to enjoy a great workout. A wide range of adjustability in the stride so that people of different heights can use the machine comfortably. Adjustable ramp that allows you to climb up to 30 degrees. Large, sturdy elliptical that recreates that gym experience. Heart-rate monitoring available on the hand grabs. Built in fan so that you can stay cool during your workouts. Warranty that covers electronics and parts for five years and labor for two years. High price tag: $1979.97 at the time of this writing. Although standard programs are included, there are only 6 of them. However, the complaints are a small percentage of reviews. 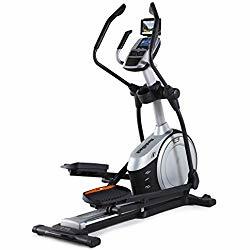 Made by the trusted name, Schwinn, this elliptical machine packs in the value with a large number of workout programs so you can find one that meets you right at your level. In addition, the Schwinn allows you to climb through your workout with it's incline function. Overall, you'll get a great range of features without blowing your budget. 22 workout programs gives you great variety when exercising. A variety of incline options are available. Heart rate monitors are available on the handlebars. #7 bestseller on Amazon for elliptical trainers, which is impressive. Reasonable cost: $449 at the time of this writing. The step size is not adjustable. Some of the most common complaints include that the machine makes too much noise/strange noises, while others claim that the customer service to solve issues was terrible. 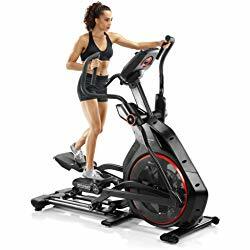 The Nautilus Elliptical Trainer is an excellent elliptical machine thanks to its wide range of workout programs included with the machine. 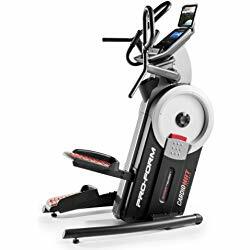 There are many positive aspects about this machine, such as the heart rate monitors and wide resistance range, especially considering the reasonable price. However, it's not as easy to adjust as some of the other models since you'll have to crouch down to change the incline settings, which are manually operated. There's a great variety of workouts: 22 are included on this unit. There are 20 resistance levels, allowing you to adjust your workout to your needs. There are heart rate monitors on the handlebars. Most reviews are positive, 70% are 4 stars or greater. Reasonable price: $699 at the time of this writing. The ramp/incline adjustment is manual, meaning it can be inconvenient to make changes mid-workout. The step or stride is not adjustable, although it is a long 20 inches. Most of the complaints about the model are about the quality of the machine. Includes plenty of workout options. The machine has 26 built-in workouts and you can also use iFit or Google Maps Training Routes for virtual and more personalized training. Adjustable incline is included to help you adjust the difficulty of your workouts. Twenty-two different resistance levels are also included. You can adjust your stride easily at the touch of a button. The elliptical comes with a 1 year labor warranty and a 2 year parts warranty. Heart-rate grips are included on the handlebars. Reasonable cost: $500 at the time of this writing. Customers complain that customer service through NordicTrack isn't very good. Some customers report that the elliptical is made poorly. This incredibly economical elliptical machine is popular with good reason. It's tiny, it's cheap and you can use it sitting or standing. While it's not full of bells and whistles, this elliptical includes enough basic functions and resistance options for you to get a solid workout. 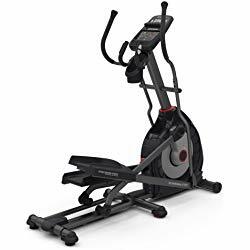 If you're looking for an elliptical you can shove in your closet when it's not in use, the Stamina In-Motion is an excellent choice. Can be used while sitting or standing. Involves a great core workout when standing since there are no hand supports. Tiny and lightweight! It can fit under your desk or in your closet easily. Most customers gave positive reviews. Very cheap: $86.87 at the time of the writing. The resistance adjustment is manual. No big screen, although basic facts about your workout are available. One common complaint is that the elliptical machine becomes squeaky. A more robust type of elliptical trainer that will give you more of a gym-like experience, the Bowflex offers a solid machine. This machine offers Bluetooth connectivity so that you can use the machine alongside various apps such as RunSocial that will make your workouts more exciting and interactive. In addition, the Bowflex offers an impressive 25 different resistance levels. You don't even have to move your hands to adjust the difficulty level, as you can use the buttons on the handlebars to do so. If you're ready for a professional experience, the Bowflex is a great choice. Bluetooth connectivity allows you to connect using various apps such as RunSocial App. Adjust incline on your handlebars instead of having to operate the machine via the screen. Adjust the level of tilt on your feet for maximum comfort. 25 levels of resistance allow you to work just as hard as you want to. There are some workout programs, 9 in total. The customer reviews are a bit of a mixed bag. The negative reviews complain about the quality of the Bowflex machine. Some customers struggled to get their issues with the machine resolved while others had trouble getting helpful answers from customer service representatives. On the expensive end: $1399 at the time of this writing. Size: Most elliptical trainer machines are large. Determine how much space you have and check the footprint of the machines you're interested in before purchasing. An important aspect to note is that ellipticals may put you pretty far off the ground, so ceiling height is also important, depending on your height. Stride length is also an important consideration. The taller you are, the greater your stride will likely be. Budget: Think about how much money you have to spend on this piece of exercise equipment. Then, compare a few machines that are within your budget constraints before purchasing. Your Exercise Needs: What do you need in an elliptical trainer? Make sure that there are enough exercise programs, resistance levels and incline levels to meet your needs. If you're a die-hard iFit fan, make sure you'll be able to use these sorts of programs with your elliptical machine. Reviews: Have confidence in your purchase by choosing a machine with mostly positive reviews. However, to remember that there will always be some negative reviews, and those leaving a bad review are sometimes the most motivated - they want to vent! So don't be disheartened about buying your dream elliptical due to a few bad reviews. As long as you choose an appropriate workout for your fitness needs, the elliptical can provide a great workout! Primarily a cardio workout, you can adjust the way you workout to meet your needs. Add incline to mimic climbing hills and adjust your resistance and speed throughout your workout for a perfect experience. Does using an elliptical help with weight loss? Sure! But you have to follow the right workout protocols. Research shows that HIIT style workouts are best. What does that mean? Try to go at your maximum pace and effort for a minute, then slow down for 2 minutes. Then, go full-on for a minute again, before taking it easy for another 2 minutes. Repeat, repeat and repeat until you've completed 20 minutes total. But, for best results, make sure you accompany your efforts on the elliptical with a healthy diet. Which muscle groups are targeted with the elliptical? If your elliptical machine has moving handlebars, then you can get an upper body and lower body workout. Make sure you think about using your arms intentionally for best results. In addition, your core muscles get a workout as you need to stabilize your body while moving both your arms and legs. The best elliptical machine for one person may not be the best for another person. It all depends on the space, budget and needs you have. 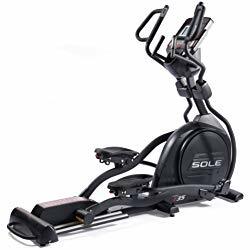 We hope that this list of the top elliptical machines in 2019 will help you as you search for your new piece of workout equipment. With a quality machine at home, you'll work quickly to achieve your fitness goals. Whether you want to lose weight, get toned or boost your endurance, an elliptical is a practical, low-impact, and effective way to bring your fitness goals to life!